I love coffee. Every day, coffee first thing in the morning, another in midmorning, but rarely a third cup, unless it’s a special occasion, or I really need it… okay, I usually end up having a third cup. I love the smell wafting through the house, the sound of it bubbling up in its stovetop pot, the taste of bitter black strong coffee freshly made, the hedonistic ritual, but mostly I love the rush. So imagine my horror when the scientists tell us there is to be no coffee or tea at all during our seven days of sleep deprivation. I checked the Geneva Convention. Coffee’s not in there. I need coffee. Alert, with an increased heart rate, maybe a little jittery anxiety, an elevated sense of self-belief, a busy mind: the perfect conditions for writing. Dull-witted, a little sleepy? I see no point. I admit an addiction. I’ve developed a tolerance to caffeine to the point where I’m dependent on it for ordinary alertness. Maybe I can live without it. But writing without it? I’m fairly sure that depriving me of coffee suddenly would have a far more dramatic effect than depriving me of sleep. I’m not sure I could guarantee my co-subjects’ safety. So two weeks before The Subjects, I drop down to one coffee a day. One coffee and a cup of tea in the early afternoon, when my whole body starts to go into zombie mode. Then just the morning coffee, a little later each day. I have withdrawn myself from this drug before, and I am careful. I know what a delicate process it can be. Headaches, mood swings, fatigue, more mood swings, and the intellectual energy of a mollusc. Within a week, I am off coffee entirely. And aside from one all-day headache and a constant impulse to nap, I’m okay. Addiction is a physical experience, and withdrawal reminds you how vulnerable your body is. It turns out I spend a lot of time cheating my circadian rhythms, and my brain spends a lot of time mildly buzzed. 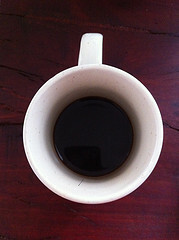 Without coffee, I struggle to think consistently clearly. I’m an unfocused writer at the best of times. While I normally put in eight hours at the desk, that mid-afternoon circadian slump grinds my working day to a halt hours early. I feel I could sleep for the rest of the day and on into the following morning. I try to shake the tiredness by going for a walk or a ride, and exercise seems to have an alertness payoff, but my thoughts feel slow, my brain dragging along behind my body like it’s being marched to some decaf gulag. Addiction is also a cultural phenomenon, and an emotional one. Twitter sympathises and/or gloats cruelly as I post #quittingcoffee updates. I have a shared identity as a coffee drinker which shores up my other social identities, particularly as a writer. Writers are famous for our caffeine intake, and with good reason. I don’t think it’s a coincidence that the Enlightenment followed close on the heels of the introduction of coffee to Europe. Or that the first recorded use of coffee was in Sufi communities in the 15th century, where some of the greatest poetry in human history was written. Writing is hard enough with coffee, and I’m surprised to find it’s possible without. In fact, after a few days, the feeling of being jet lagged has withdrawn, I’m getting up in the morning with a bright mind again, and staying relatively alert throughout the day. The circadian slump is still there, but I can work through it. Of course, I’m only achieving this with extravagant promises of more coffee later. As soon as we’re released, I’m heading straight for the nearest long black. After a full two weeks without coffee, the rush will be amazing.